Molecular Diagnostics Market size was valued at USD 7.2 billion in 2017 and is expected to witness more than 8.5% CAGR from 2018 to 2024. Increasing geriatric population across the globe will render significant positive impact on molecular diagnostics market growth over the forecast timeframe. Aging substantially increases the risk of infectious as well as chronic conditions that can be better addressed if diagnosed at initial stage of development. United Nations has predicted that geriatric population will increase from 962 million in 2017 to 2.1 billion by 2050. 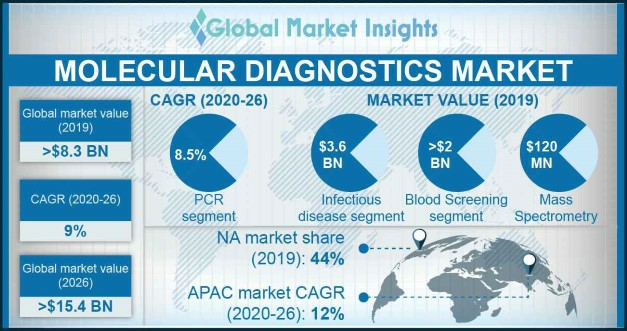 Such huge increase in elderly population base and consequent rise in demand for early and improved diagnostic methods will spur the molecular diagnostics market growth. Aging population prefers non-hospital settings such as home care due to comfort and economic benefits associated with it. This has generated the need for point of care diagnostic testing that provides accurate and rapid results. Industry players are putting efforts in the development of point of care molecular diagnostic tests to exploit this growth opportunity. Intense demand for point of care molecular diagnostic will support molecular diagnostics industry growth in foreseeable future. Infectious disease application segment accounted for USD 3.3 billion in 2017 and will dominate the molecular diagnostics industry throughout the analysis period. Molecular diagnostics enables detection of infectious diseases with rapid turnaround time and far greater accuracy. Rising prevalence of infectious diseases such as tuberculosis, hepatitis coupled with increasing awareness regarding the benefits of early diagnosis of infectious diseases will drive segment growth over forecast timeframe. Oncology application segment will witness 8% CAGR from 2018 to 2024. The segment will grow as our fundamental understanding of cancer mechanism at molecular levels continues to rise. The understanding of wide range of cancers at molecular level enables us to determine the exact cause of disease and develop the treatment tailored to individual needs. Molecular diagnostic can even access the risk of developing a disease and determine whether the individual is carrier of the disease. With ongoing research and development activities, molecular diagnostics is forecasted to play vital role in the field of oncology. Sequencing technology segment is forecasted to witness 14.7% CAGR over the forecast period. Sequencing is being widely used in molecular diagnosis of paediatric diseases such as Duchenne muscular dystrophy and monogenic diabetes. Sanger sequencing is the choice of method for mutation screening, however next generation sequencing (NGS) is rapidly being recognized as most efficient technology for detection and screening of genetic variations. Targeted NGS offers better quality and simplified dataset analysis that will spur its demand in near future. PCR application segment accounted for USD 3.1 billion in 2017 and is estimated to dominate the industry throughout the analysis period. Technological advancements resulting in the development of superior techniques such as Real Time PCR that offers better results will augment the segment growth. However, the segment will lose some revenue to new and innovative technologies such as sequencing in the coming years. Germany molecular diagnostics market accounted for USD 426.1 million is 2017. Germany currently dominates the European molecular diagnostic industry and scenario is likely to remain so in near future. Increasing incidences of lifestyle and infectious diseases coupled with favourable demographic trends such as aging population will drive the industry growth. Robust research and development in molecular diagnostic field and high awareness regarding the benefits of early diagnosis will expand the molecular diagnostics market growth in Germany. Asia Pacific molecular diagnostics market is estimated to show 11.4% CAGR from 2018 to 2024. Rapidly growing molecular diagnostics market in developing economies such as India and China will drive the regional growth. Increasing awareness and accessibility to advanced molecular diagnostic services, presence of large patient pool and developing healthcare infrastructure will further augment region growth. 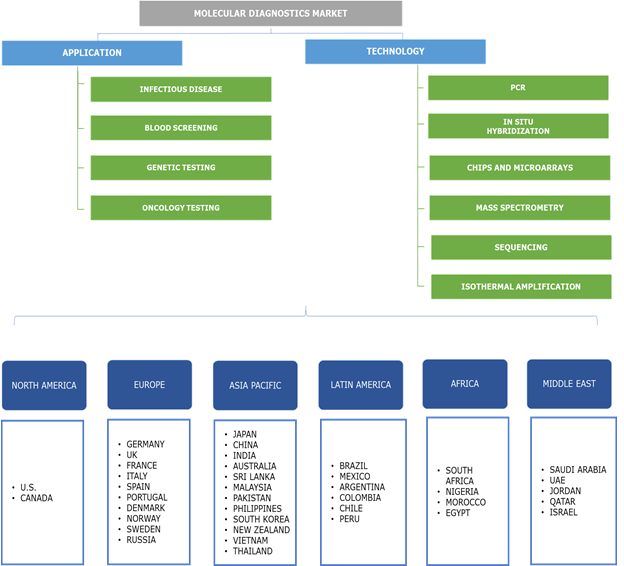 Some of the key players operating in global molecular diagnostics market are Abbott Molecular Cepheid, BioMerieux’s, Roche diagnostics, Danaher Corporation, Siemens Healthcare, Qiagen Gaithersburg, Johnson and Johnson, Agilent (Dako), GenMark diagnostics, Analytik Jena and Alere Inc. Key strategies adopted by most of the key industry players include new product launch, mergers, acquisitions, and distribution agreements to strengthen product portfolio and maintain their market position. For instance, in September 2017, Becton Dickinson and Company entered into distribution agreement with Euroclone for distribution of molecular tests. Molecular diagnostics is the rapidly growing segment of in-vitro diagnostic market. While the market is well established in developed economies, developing economies are still dependent on traditional diagnostic technologies. However, developing economies will witness robust growth in the coming years due to rising awareness and growing healthcare spending. Infectious disease testing currently represents largest segment in the industry while genetic testing and oncology testing are amongst the fastest growing application segments. Industry players are engaged in the development of better molecular diagnostic tests with rapid turnaround time to garner higher revenue shares. With advancements in existing technologies and rising demand of precise diagnostic methods, molecular diagnostic industry will offer promising growth opportunities in near future.